Liver cirrhosis is the final stage of all liver diseases and associated with a high mortality worldwide. Nevertheless, the pathophysiology is poorly understood and, consequently, no targeted treatment options exist despite intensive research activities over many decades. This paper introduces the sinusoidal pressure hypothesis (SPH), which identifies an elevation of sinusoidal pressure (SP) as the cause of fibrosis. SPH is an integrative concept derived from various biophysical, cellular, hemodynamic and clinical findings. It has been mainly stimulated by observations using the recently developed transient elastography (TE) to measure liver stiffness (LS). Although TE was primarily introduced to the liver community as diagnostic screening tool for liver fibrosis, it has been rapidly learnt that pressure-associated conditions are important confounding factors of elevated LS. Moreover and although long term data are still scarce, it has increasingly become evident that elevated LS per se is a prognostic unfavorable condition and a predictor of liver-related mortality. In contrast, a normal LS rules out manifest chronic liver disease and fibrosis. Based on a first article published in 2010, a much more detailed concept is presented here which has been encouraged by novel preliminary findings as well as the resonance at various meetings including the conferences of the German-Romanian Society of Gastroenterology in Temeswar 2016 and the EASL monothematic conference on fibrosis in Porto in 2016. The term pressure hypothesis has now been specified more precisely “SPH”. SPH is divided into two parts: While part I refers to pressure-mediated fibrosis progression, the novel part II encompasses “arterialization” as an important step of self-perpetuation leading to continued pressure elevation in the low-pressure-organ and defining the “point of no return” with irreversible fibrosis progression. SPH could provide a major framework for a better understanding of disease formation based on biomechanics. It will hopefully lead to the design of novel experiments and studies to undergo the meticulous process of verification and falsification. Pressure as a driving force of fibrogenesis could be used to better understand the genetics, proteomics and metabolomics that modulate pressure-mediated biomechanical processes instead of focusing on the search of target genes in e.g., genome wide studies. A major methodological challenge is still the fact that SP per se cannot be directly addressed by e.g., micro-sensors but it rather requires the interpretation of indirect data combined with common sense and logical reasoning. In the long term perspective, it is hoped that SP may be addressable directly with the recent development of molecular “mechanic force sensors” still in status nascendi. In addition, SPH draws a closer attention to often overlooked mechanic aspects in biological tissues that not only include hydrostatic pressure but also the mechanic energy transferred by the cardiac pulse wave and its absorption by hepatic tissue and fat. Moreover, the SPH also opens up new views on the mechanic role of fat and it may stimulate studies of disease mechanisms in other organs. Introducing pressure to the pathology of liver fibrosis, SPH naturally addresses the important issue of how to lower and modulate SP to prevent disease progression. It is hoped that the concept of the SPH may lead to a better individual patient selection and optimized therapeutic concepts in the future. In the following, SPH will be explained after providing a short background and the description of hitherto unexplained observations in the research area of cirrhosis. Cardiac cirrhosis will be discussed in more detail since it represents a rarely discussed non-inflammatory form of pressure-associated cirrhosis. At the end, specific consequences of SPH are discussed, their relation to various clinical and preliminary findings and potential future therapeutic directions. Chronic liver diseases frequently lead to scarring (cirrhosis), a process in which the architectural organization of functional liver units becomes disrupted. Liver cirrhosis is the result of excessive accumulation of extracellular matrix (ECM) with increased LS. This is often accompanied by a progressive loss of organ function despite the use of immunosuppressive, anti-viral or anti-inflammatory agents[5,6]. Excess ECM deposition also causes progressive elevation of the hepatic vascular resistance with important hemodynamic consequences including portal hypertension, the formation of vascular collaterals and the so-called hyperdynamic circulation with elevated cardiac output and lowered arterial pressure. Moreover, liver cirrhosis is an important pre-cancerogenic lesion finally resulting in hepatocellular cancer (HCC). At present, HCC shows the second fastest growth rate worldwide and ranks at third place in cancer-related mortality[8,9]. More than 90% of HCCs develop in cirrhotic livers mostly due to alcoholic liver disease (ALD) or chronic hepatitis C[10,11]. Currently, progression of fibrosis to cirrhosis is most efficiently blocked by treating the underlying disease but no satisfying anti-fibrotic treatment regimen exists to directly attack the fibrotic processes. Finally, it should be mentioned that only a minority typically progress towards cirrhosis while many patients with chronic liver disease will never end up with cirrhosis. This variety is largely affected by disease-related factors (for example, viral genotype) or host-related factors (e.g., genetic/epigenetic). Figure 1 Liver fibrosis. A: Conventional sequence of fibrosis progression. Here, elevated liver stiffness (LS) is primarily regarded as correlate of matrix deposition (fibrosis stage); B: Macroscopic aspect of a cirrhotic liver in a patient with alcoholic liver disease (courtesy of C. Lackner, University of Graz). Note the large fibrous septa spanning through the whole organ which are clearly visible at the macroscopic level. In addition, a primary liver cancer (HCC) can be seen (green area). HCC: Hepatocellular carcinoma; HSC: Hepatic stellate cells. (1) It is not clear why different liver etiologies ranging from inflammatory, infectious, biliary, metabolic or even non-inflammatory causes such as congestion ultimately lead to histologically almost identical forms of liver cirrhosis. Especially non-inflammatory causes such as cardiac cirrhosis remain poorly understood although they can develop the full scale of complications ranging from portal hypertension to liver cancer. This also refers to other rare hemodynamic causes of fibrosis such as experimental portal ligation or the Budd-Chiari syndrome. For a better overview, Supplemental Table 1 represents a list of different etiologies that all cause fibrosis. This table also provides current information on LS elevation and AST/ALT ratio that is relevant for the discussions below. (2) At present, typical macroscopic features of cirrhosis such as large fibrous septa spanning over several centimeters through the organ (Figure 1B) cannot be explained e.g., by the action of local humoral factors or profibrogenic cytokines such as TGFbeta. It is also not clear why fibrous septa during conversion of micro-nodular to macro-nodular cirrhosis may fuse to very large septa. These septa may partly resolve during regression of fibrosis after e.g., viral clearance. (3) It is known that fibrosis can partly or even fully reverse at earlier stages while end-stage cirrhosis will further progress even in the absence of the initial cause e.g., after abstaining from alcohol or successful HCV treatment. This so-called “point of no return” is not well understood nor the underlying mechanisms. In addition, this critical time point cannot be exactly defined in individual patients, an important draw back for prognosis evaluation and treatment initiation. (4) So far, various systemic search strategies either based on genetics, proteomics or metabolomics have not been able to provide a clear understanding of the molecular mechanisms of fibrosis[16-18]. (5) For decades, hepatic steatosis has been considered a mandatory prerequisite for fibrosis (Figure 1A). However, this mandatory role of steatosis for fibrosis progression is increasingly questioned[19,20]. So, although steatosis is abundant in patients who consume alcohol, only a minority of ca. 20% progress to fibrosis. In fact, many subjects with overweight show “benign” fat accumulation without lipotoxicity and inflammation. In addition, segmental steatosis can often be observed by ultrasound imaging of the liver but no segmental fibrosis or cirrhosis has been reported so far. (6) It remains unclear why typical etiologies of human liver cirrhosis such as ALD and NAFLD are difficult to reproduce in small standard animal models such as mice and rats despite inflammation and steatosis. Robust cirrhosis is only generated in very toxic models such as CCl4 or TAA treatment. Measurement of LS to assess liver fibrosis has been introduced more than 10 years ago and is now increasingly used worldwide for fibrosis screening. During fibrosis progression, LS increases continuously from ca. 4 kPa up to 75 kPa (upper detection limit of the Fibroscan device). A threshold of 12.5 kPa is widely considered as cut-off value of histological F4 cirrhosis stage. The data from more than 500 clinical studies can be briefly summarized as follows with regard to their relevance for SPH: (1) LS highly correlates with histological fibrosis stage independent of the underlying liver disease (r > 0.8). A normal LS (< 6 kPa) excludes liver pathology and liver fibrosis; (2) irrespective of cirrhosis, LS can be drastically but reversibly elevated under conditions such as inflammation, cholestasis and congestion (Figures 2 and 3). In the long term perspective, these conditions are all able to cause cirrhosis and they are typically associated with intra-hepatic pressure changes. Moreover, as shown in Figure 4B, LS correlates directly with SP in non-cirrhotic livers; (3) pressure-related elevation of LS precedes the development of fibrosis[3,26,27]. Vice versa, LS improves after elimination of liver pathology e.g., after clearance of HCV, water elimination by diuretics in patients with heart failure and liver congestion or alcohol withdrawal (Figure 3); and (4) LS is an independent predictor of liver-related mortality[30,31]. Genetic risk factors of liver disease such as some PNPLA3 variants are also known to cause LS elevation e.g., in the presence of alcohol consumption. 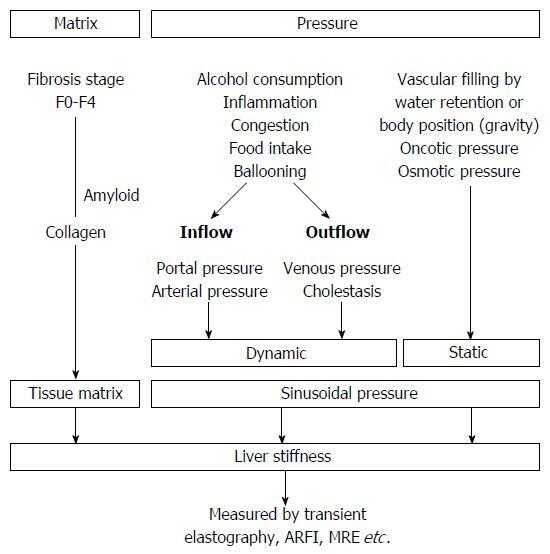 Figure 2 Liver stiffness is modulated both by matrix and pressure-associated conditions. Both dynamic and static components affect the sinusoidal pressure. MRE: Magnetic resonance elastography; ARFI: Acoustic radiation force imaging. Figure 3 Examples of reversible pressure-mediated changes of liver stiffness. A: Reversible drastic increase of liver stiffness (LS) after clamping of the caval vein in narcotized landrace pigs (modified from Ref. ); B: Decrease of LS after alcohol detoxification in a heavy female drinker unmasks the inflammation-related LS from the fibrosis-related LS. F2 fibrosis was confirmed histologically. Modified from Ref. . 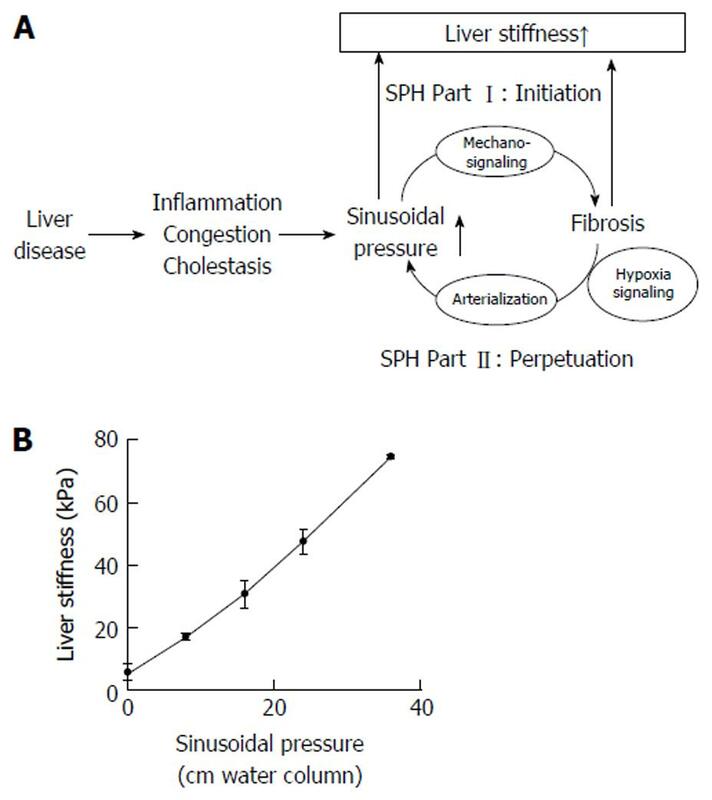 Figure 4 The sinusoidal pressure hypothesis and the role of liver stiffness. A: Sinusoidal pressure hypothesis at the whole organ level. SP is the driving force of matrix deposition. Irrespective of the etiology, all liver pathologies (shown in the left) increase the SP that initiates matrix deposition via specific inter- and intracellular biomechanic signaling pathways (SPH Part I, Initiation). LS should be regarded as the combined read-out of elevated pressure and fibrosis. Both SP elevation and matrix deposition increase vascular resistance that ultimately lead to elevated hepatic arterial flow and finally complete arterial blood supply. The arterial response is mainly driven by hypoxia signaling and metabolic demand. Depending on dosage (> 12 mmHg) and time (> 4 wk), this vicious cycle will ultimately cause a complete arterialization leading to irreversible cirrhosis by exposing the low pressure organ to permanent high pressure (SPH Part II, Perpetuation); B: LS almost linearly depends on sinusoidal pressure in an isolated pig liver. 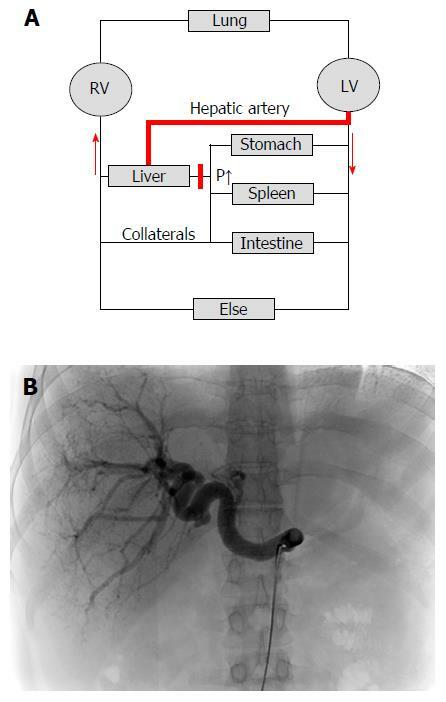 In this experiment (modified from ), all vessels (caval and portal vein, hepatic artery and common bile duct) were ligated. The isolated organ was increasingly filled with isotonic sodium chloride solution and put under pressure. Under these conditions, according to the physical law of communicating pipes, the pressure within the caval or portal vein directly matches the SP. Similar to compliance studies in lungs, LS will show a slower increase at higher SP levels (not shown). LS: Liver stiffness; SP: Sinusoidal pressure; SPH: Sinusoidal pressure hypothesis. Initially, elevated LS was solely regarded as a consequence of fibrosis progression. Especially the observation that an increase of the central venous pressure as well as the intra-ductal biliary pressure are able to drastically and reversibly elevate LS without any other confounders such as inflammation[25,33-35] suggested an important role of the SP in mediating fibrosis. In this context, it is important to conceive that inflammatory liver diseases are also associated with pressure change like in any other tissue (e.g., skin induration and swelling in patients with skin abscesses or furuncle). It is well established in the field of pathology that inflamed tissues are hyper-vascularized (rubor, calor, tumor, functio laesa). The reasons for this are manifold and include infiltration of inflammatory cells or enhanced arterial perfusion through the action of vasodilating agents and cytokines. The development of inflammatory edema and the swelling of cells may further contribute to an elevated tissue stiffness (tumor) but it will always mainly be caused by hyper-perfusion requiring a well-functioning blood circulation. This fact has been rather put aside in many previous studies on fibrosis progression normally focusing on humoral, inflammatory, genetic and many other conditions but not hemodynamic consequences and pressure. It is also the reason why in vitro studies on the molecular mechanisms of fibrosis progression may have missed the role of pressure for tissue stiffness. Table 1 Part I (initiation) and II (perpetuation) of sinusoidal pressure hypothesis. 1. All liver diseases cause SP elevation. SP is the combined result of dynamic and static components that include the hepatic inflow/outflow balance, intra- and extrahepatic shunts as well as vascular filling by water retention and osmotic pressure. 2. LS represents the sum of matrix deposition (fibrosis) and SP. In non-cirrhotic livers, LS corresponds to SP. 3. Dosage and time of elevated SP/LS determine fibrosis progression (biomechanic signaling). Matrix deposition ultimately matches SP (force = counter force). 4. At the cellular level, SP elevation causes stretch forces on perisinusoidal cells that ultimately lead to collagen (matrix) deposition via inter- and intracellular biomechanic signaling. 1. At a LS of ca. 12 kPa/SP of 12 mmHg, arterial blood supply becomes essential ultimately leading to arterialization of the liver (via hypoxia-signaling including HABR, VEGF etc.). 2. Arterial supply is ultimately not reversible causing loss of endothelial fenestrae, capillarization and sustained SP and LS elevation. 3. Arterialization initiates a vicious cycle leading to further matrix deposition, eventual complete disconnection of hepatocytes from blood supply and ischemia with subsequent arterialization and nodular regeneration. 4. Finally, the arterialized liver (high oxygen, high pressure) combined with cell death and enhanced regeneration will cause a pro-cancerogenic environment and HCC. SPH: Sinusoidal pressure hypothesis; HABR: Hepatic arterial buffer response; HCC: Hepatocellular carcinoma; LS: Liver stiffness; SP: Sinusoidal pressure; VEGF: Vascular endothelial growth factor. (1) According to SPH, all potential causes of cirrhosis whether of inflammatory or non-inflammatory origin ultimately lead to an elevated SP. In contrast to conventional concepts in which pressure changes such as portal hypertension are merely seen as a consequence of cirrhosis, SP is the primary cause for matrix deposition. SP consists of dynamic and static components such as hepatic inflow and outflow balances or water retention (Figure 2). Even minimal increases of SP seem to be critical for the low-pressure organ liver which is typically exposed to no more than ca. 6 mm of mercury via the portal vein. SP elevation may first develop in portal or central areas depending on the localization of the underlying disease (e.g., portal-tract disease such as HCV vs perivenular disease such as ALD). (2) In contrast to conventional concepts (Figure 1A), elevated LS is the consequence of both elevated SP and increased matrix deposition. This also means that LS almost exclusively mirrors SP in the absence of fibrosis (Figure 4B). (3) At the cellular level and as will be discussed below, SP is the actual driving force for the production of ECM by stretching of perisinusoidal cells e.g., HSCs, fibroblasts and liver endothelial cells. It remains open whether these cells simply “feel” the surrounding pressure-mediated stiffness by dedicated sensing mechanisms or whether they directly sense pressure-mediated stretch forces. So far, stiffness-mediated activation of HSC has not been linked to pressure or SP[14,37]. According to the physics of mechanics, it is easily conceivable that pressure-induced stretch forces will overlay at the whole organ levels leading to regions with high trajectory forces and consequent large septa formation. SP-mediated stretch forces and matrix are in continuous equilibrium. Dosage and time of elevated SP/LS determine fibrosis progression (biomechanic signaling) eventually leading to a degree of matrix deposition that “matches” the pressure. Experimental and common clinical observations suggest that a SP > 12 mmHg and a time period > 4 wk are critical thresholds to be validated. It is needless to add that all of these pressure-mediated processes will be modulated by other environmental and genetic factors e.g., the sensitivity of the liver tissues in responding towards pressure changes. The hepatic artery is directly connected to the sinusoidal bed via arteriole inlets and provides about 20% of blood in a normal healthy liver. The stiffer the liver becomes due to inflammation or fibrosis the more pressure is required to maintain sufficient blood flow. Although the elevation of portal pressure (portal hypertension > 12 mmHg) can partly maintain some portal flow it will hardly reach values higher than 35 mmHg. Under these conditions, the hepatic artery will be the only vessel with sufficiently high pressure to maintain hepatic blood supply (Figure 5A). An example (CT angiography) of a patient with a manifest cirrhosis and a strong hepatic artery with an almost exclusive arterial perfusion is demonstrated in Figure 5B. This arterialization is an important hallmark of cirrhotic livers. It is also part of the daily experience of liver sonographers that cirrhotic livers are characterized by large hepatic arteries with a strong perfusion signal. In contrast, the hepatic artery is almost invisible in normal livers. Even after cirrhosis has been established, the hepatic arterial flow velocity and volume will further increase when progressing from Child-Pugh stage A to C stage, respectively. This has been recently confirmed in whole-liver perfusion enhanced CT imaging scan studies. Enhanced angiogenesis has also been observed before the manifestation of fibrosis in small animal models using contrast-enhanced micro CT. Taken together, all these established clinical and experimental findings allow us to conclude that stiff cirrhotic livers are ultimately exposed to predominant arterial perfusion. Figure 5 Cirrhotic livers are primarily supplied with blood by the hepatic artery (arterialization). A: Hemodynamics of the low-pressure organ liver in the context of systemic circulation. Cirrhosis causes an increased vascular resistance, collateral formation and increased hepatic arterial flow to maintain hepatic perfusion. Elevated hepatic arterial flow can be observed already before the onset of fibrosis. It eventually leads to a complete arterialization of the cirrhotic liver. In some cases, portal flow completely reverses (so called hepatofugal flow) and hepatic blood exits the liver both via hepatic and portal veins. Note that the blood circulation (red arrows) is functionally maintained by two serial pumps (RV and LV). A dysbalance of these two pumps such as observed during right heart failure can also cause higher SP (congestion) and ultimately cardiac liver cirrhosis; B: Cirrhotic livers are characterized by predominant arterial blood supply. CT angiography of a patient with liver cirrhosis showing a prominent hepatic artery in 31 years old female patient with cryptogenic liver cirrhosis Child A (courtesy of Dr. B. Radeleff, University of Heidelberg). Under such conditions, the hepatic artery supplies the liver with more than 80% of blood. RV: Right ventricle; LV: Left ventricle; CT: Computed tomography. Elevation of hepatic arterial flow and subsequent arterialization is mainly driven by the HABR and hypoxia signaling. SPH postulates that this arterialization defines the so-called “point of no return”. It provides a pressure-based rationale to explain the self-perpetuation of fibrosis progression and the uniform, etiology-independent progression of fibrosis. Arterialization of the fibrotic liver ultimately leads to a sustained exposure of the low-pressure organ liver (typically < 6 mmHg) to higher pressures (Figure 5). In ca. 7% of patients with cirrhosis, extreme flow changes can be observed such as complete reversal of the portal flow (so called hepatofugal portal flow). Part II of SPH is summarized in Table 1 and depicted in Figure 4A. At the end, the arterialized liver (high oxygen, high pressure) together with massive matrix deposition will cause self-inflicted ischemia. The combination of these events stimulates the formation of regenerative nodule finally causing the typical nodular aspect of cirrhotic livers. High pressure in combination with cell death and enhanced regeneration ultimately provides an ideal environment of genetic instability and formation of cancer (HCC). It is also postulated that the typical laboratory finding of cirrhotic livers, an increased AST/ALT ratio and a slight GGT elevation (see Supplemental Table 1) is indicative for the stage of arterialization. CARDIAC CIRRHOSIS - AN EXAMPLE OF NON-INFLAMMATORY, PRESSURE-INDUCED FIBROSIS? Before the concept of SPH, pressure-associated fibrosis formation in the absence of inflammation has not been appreciated very much. Indeed, most liver diseases seen in daily practice are more or less related to inflammation. However, cardiac cirrhosis is a typically non-inflammatory disease developing in patients with right heart failure and liver congestion. It is mostly but not always seen in the elderly and seems to be solely related to pressure. Notably, cardiac cirrhosis has not been in the focus of studies performed both by cardiologists and hepatologists. A major reason may be that these patients are usually > 70 years old, often present to the hospital in life threatening conditions which impose ethical restrictions for study recruitment. On the other side, decompensated heart failure is one of the most common causes of hospitalization and death in the elderly. First profound insights have been already provided in a now classical work by Sherlock in 1951. Up to date, pressure, hypoxia or nutritional aspects have been discussed as causative underlying factors and its existence has even been questioned by some authors. However, in one of the standard text books on liver histology written by Lefkowitch et al, cardiac cirrhosis is described in detail with all its histological features. Cardiac cirrhosis can develop rapidly even in young patients with congenital malformation of the heart after the Fontan procedure. These patients will develop portal hypertension, esophageal varices and they can even die from primary liver cancer[49,50]. Figure 6 shows a typical finding of bridging cirrhosis both in an elderly patient with chronic heart failure (Figure 6A-F) and in a young patient after Fontan operation (Figure 6G and H). Hepatic hypoxia can be generally ruled out as cause of cardiac cirrhosis since real ischemia typically leads to dramatic increases of transaminase levels (higher than 1000 U/L with AST > ALT) seen e.g., during acute heart failure or resuscitation. To learn more about the principal development of fibrosis during congestion, we recently explored an experimental model in Wistar rats of liver congestion by clamping the caval vein subphrenically over 4 mo. LS was measured invasively using the novel Fibroscan platform (Echosens, Paris). As shown in Figure 7, congestion significantly and immediately increased LS from mean 6.0 to 10.7 kPa (P < 10-12). Of note, the semiquantitative Chevallier fibrosis score significantly increased from 0 to 7. At the mRNA level, profibrogenic markers TGF-β and α-SMA were significantly upregulated. 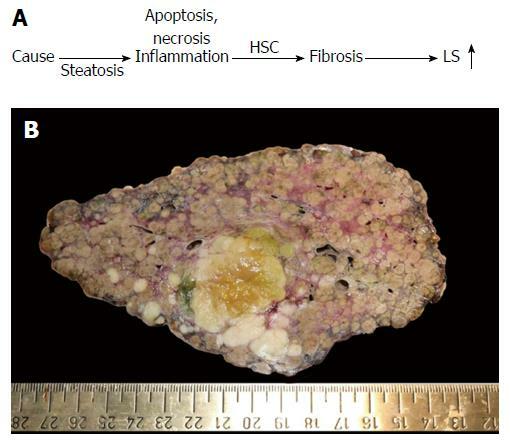 Importantly, detailed histological analysis ruled out inflammation, necrosis or liver injury in this model. In addition, transaminases were not elevated. These findings indicate that increased venous pressure and LS are associated with a pronounced pro-fibrogenic response and histological fibrosis progression in the absence of inflammation. Taken together, patients with longstanding liver congestion during heart failure provide typical examples of pressure-associated fibrosis in the absence of inflammation. Figure 6 Cardiac cirrhosis as example of a pressure-associated cirrhosis in the absence of notable inflammation. Patients with congestive heart failure may even die from complications of cirrhosis such as variceal bleeding or liver cancer. Note the absence of inflammation in areas with sinusoidal dilation and congestion in long-lasting congestion characterized by marked sinusoidal dilation and atrophy of liver cell plates. Early (A) and advanced (B) stages of congestive heart failure stained by hematoxyline and eosin. Portal tracts and centrilobular areas are marked with black triangles and squares, respectively. Inflammation is also not a feature in areas with sinusoidal dilation and congestion in intermediate and central portions of the lobules. C: Chromotrope aniline blue stain (fibrosis) of an early stage of congestive hepatopathy in a case with congestive heart failure. The portal tract and its structures is regular whereas in central and intermediate portions of the hepatic lobulus mild sinusoidal dilation, slight atrophy of liver cell plates and minimal perisinusoidal fibrosis are seen. D: If venous outlaw obstruction persists perisinusoidal fibrosis and atrophy of liver cell plates in centrilobular areas become more pronounced, (E) which is then followed by loss of liver cell plates and centrilobular fibrosis extending towards neighbouring central veins (F) finally resulting in fibrous septa (marked by arrow heads). Notably, portal-central relations are mostly preserved. Stain for αSMA (G) and fibrosis (Masson trichrome) (H) indicating septal and perisinusoidal fibrosis from a liver biopsy of a 31 years-old male patient with Fontan circulation. The images show diffuse activation of hepatic stellate cells in the absence of any inflammation. Fontan intervention was performed early around birth because of an unilateral ventricle. HVPG was 1 mmHg, LS was 19 kPa. (Images A-F: Courtesy of Dr. C. Lackner, University of Graz; images G-H: Courtesy of Dr. P. Bedossa, Hôpital Beaujon, Université Paris Diderot). HVPG: Hepatic venous pressure gradient; LS: Liver stiffness. Figure 7 Example of a purely pressure-driven fibrosis: Experimental liver congestion over 4 mo causes significant non-inflammatory liver fibrosis. The caval vein was subphrenically partly clamped in Wistar rats to cause hepatic congestion. 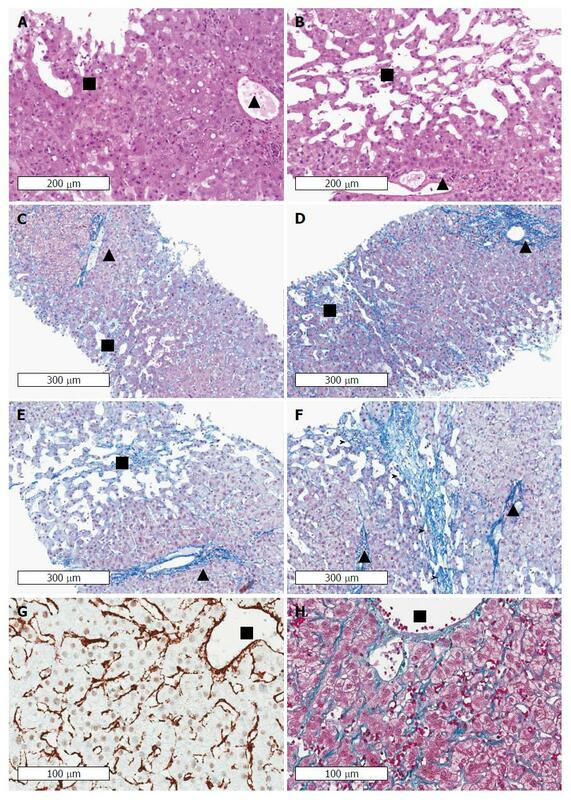 A: Illustrates LS in male Wistar rats (n = 6) in control, sham operated and clamped group immediately after onset of congestion; B: Histological analysis of liver tissue sections shows a significant development of fibrosis after 4 mo of congestion in the clamped but not sham operated animals. (data from ), bP < 0.01. LS: Liver stiffness. Pressure in the context of liver disease is usually discussed with regard to portal pressure as a consequence of cirrhosis. Portal pressure can be assessed directly during TIPS implantation or indirectly via wedge pressure measurements of a wedged hepatic vein. So far, SP cannot be determined experimentally in vivo since no miniaturized catheters exist without pressure perturbation. Although SP cannot be assessed in vivo, we recently measured SP in an isolated pig liver with clamped inflow and outflow vessels (Figure 4B). We then loaded the isolated liver with iso-osmotic sodium chloride solution and measured the hydrostatic pressure in the hepatic vein. In such an isolated and clamped organ, pressures of all communicating vessels are equal according to the physical law of communicating pipes. In the depicted pressure range of up to ca. 40 cm water column, LS correlates almost linearly with SP. For these reasons, LS can be used as an indirect and non-invasive estimate of SP in the absence of cirrhosis. It can be assumed, however, that it will reach a non-linear saturation plateau at higher pressures comparable with the compliance curve of the lung. The liver is generally a low-pressure organ with the portal vein entering the liver with a pressure of ca. 5 mmHg while ca. 3 mm of mercury are measured in the caval vein[52-54]. Close to the right atrium, this pressure can even reach negative values. Despite this low hepatic venous pressure gradient (HVPG) of ca. 3-6 mmHg, the liver is supplied with ca. 25% of the total cardiac output. This also demonstrates the very low vascular resistance of the healthy liver according to Ohm’s law of streaming fluids that easily adapts to flow changes e.g., from the splanchnic side. Consequently, the hepatic blood velocity within the sinusoidal bed is very slow which minimizes shear forces causing a predominance of the static pressure and stretch forces of the perisinusoidal cells. This will be discussed later. Figure 8 shows a simplified scheme of the vascular and biliary architecture of the liver to better illustrate the role of the various inflow, outflow and shunt factors on SP. Figure 8 Sinusoidal pressure hypothesis at the vascular level. 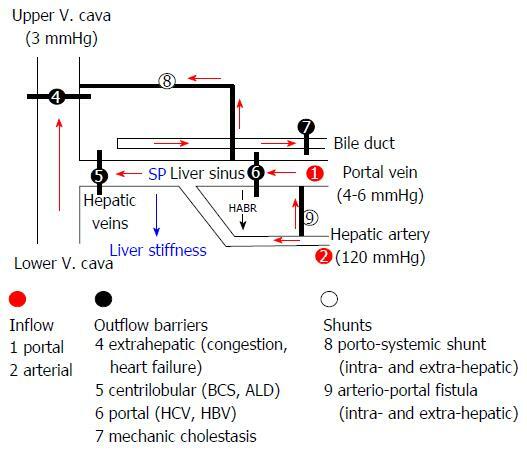 Simplified scheme of the hepatic vascular architecture and conditions that result in elevated sinusoidal pressure (SP) and liver stiffness (LS). SP and LS are shown as consequence of the various inflow (red circles) and outflow balances (black circles) in a schematized vascular architecture of the liver. Intrahepatic or extrahepatic shunts (white circles) will also affect SP in a complex manner and, according to SPH, will also have an important impact on the development of portal hypertension and liver function. According to SPH, M1 (stiff livers with good liver function) and M2 (soft liver with poor liver function) can be postulated for patients with liver cirrhosis based on intrahepatic shunt formation. Red arrows: Flow direction; HABR: Hepatic arterial buffer response; SPH: Sinusoidal pressure hypothesis. Based on the physics of liquids, SP will be mainly determined by static and dynamic components (Figure 2). The static part of the SP is determined by the intravasal pressure and the elastic properties of the vessels walls and also exists in the absence of a functioning blood circulation. Osmotic, oncotic pressure as well as gravitational forces related to the body positioning further contribute to this component. In contrast, the dynamic component is represented by the kinetic energy of the blood flow and becomes only relevant under conditions of an operating blood circulation. Here, the flow resistance constituted by the liver and the blood flow rate generated by the heart will both affect SP. Moreover, the dynamic part of SP will depend on the localization of e.g., the inflammation. Inflammatory components such as cellular swelling or infiltration of inflammatory cells will all increase the vascular resistance locally either in the portal or central areas. It explains why both a rapid increase of arterial or portal inflow or outflow barriers within the venous outflow tract (congestion), bile ducts (mechanic cholestasis) or the sinusoidal bed are able to increase LS. In clinical practice, both the static and dynamic components contribute to the overall size of SP in a complex manner. For instance, heart failure causes water retention early on through the activation of the renin angiotensin aldosterone system ultimately causing vascular overfilling with edema. LS will increase simply due to the increase of this static SP. Consequently, treatment with diuretics will decrease LS in such patients. We recently demonstrated that the decrease of LS correlates best with the decrease of weight in patients with decompensated heart failure. Besides water retention, however, the dynamic component also contributes to SP elevation in patients with heart failure. Especially in patients with predominant right heart failure, the left heart is strong enough to increase the pressure before the right heart ultimately causing liver congestion. Taken together, the introduction of pressure into the pathology of fibrosis allows various novel insights to understand fibrogenesis at the hemodynamic level. The hepatic artery is connected to the sinusoidal bed via arteriole inlets and an elevated hepatic arterial flow can be seen already before the establishment of fibrosis further increasing with the progression to cirrhosis. Moreover, the liver harbors an autonomous regulatory circuit by which the arterial perfusion is upregulated in response to decreased portal flow, the so-called hepatic arterial buffer response (HABR). HABR has been established many years ago and it is mainly explained by the pharmacological vasodilating effects of adenosine (adenosine wash out theory). Importantly, the HABR does only work in an unidirectional fashion since no elevation of portal flow can be seen in response to decreased arterial flow (Figure 8). This unidirectional aspect of the HABR appears to be highly relevant for the concept of SPH. While an increased inflow via the portal vein (e.g., during food intake) will be “buffered” by the HABR, an increase of the arterial inflow will be directly transmitted to the sinusoidal bed without “buffering”. These assumptions have been confirmed indirectly. Thus, a rapid injection of an isotonic solution (volume charge) into the portal vein does not result in LS elevation. Moreover, patients with an arterio-portal fistula of the spleen show portal hypertension but not elevated LS. In contrast, in patients with cirrhosis, LS increases more drastically in response to food intake and alcohol consumption[45,55,60]. This underlines the fact that the buffering-response of HABR will be partly or completely lost in the course of an elevated arterial flow during inflammation or a complete arterialization in the cirrhotic liver. It also means that a predominant arterial flow will be more detrimental to the liver since flow changes will not be “buffered” any longer. Thus, within the concept of SPH, arterialization and loss of the HABR will cause further pressure elevation and enhance pressure-mediated fibrosis. Both arterioportal shunts and portosystemic shunts have been described in- and outside the liver and they constitute about one third of the portal flow. Moreover, surgical shunt interventions have been explored for many years and shunt implantations such as TIPS still remain an important option in patients with severe complications of portal hypertension. According to SPH and as shown in Figure 8, these shunts will drastically modulate intra- and extrahepatic pressures. Whether and how they affect SP, fibrosis progression and liver function is still poorly understood. Shunts per definition bypass blood and, thus, they will efficiently lower pressure gradients. Recent findings on the association between LS and portal pressure seem to be related to shunt formation and collaterals. Thus, LS only seems to correlate well with portal pressure at a HVPG < 12 mmHg both in human and animal studies[55,62]. In the cirrhotic liver, LS continuously increases while portal pressure stays at lower levels due to the formation of porto-systemic collaterals such as esophageal varices. On the other side, arterio-portal hepatic fistulas have been occasionally described even further complicating the hemodynamic effects of shunts[63,64]. Such arterio-portal fistulas or shunts will decrease arterial perfusion but increase portal pressure. According to SPH, intrahepatic shunts should efficiently lower SP and thus halt pressure-mediated fibrosis progression (Figure 8). Unfortunately, the decreased SP may have detrimental effects on the nutritional and oxygen supply of the liver tissue. Taken together and as will be discussed below, SPH offers a new look at the pressure-modulating role of intrahepatic shunts not only on portal hypertension but also the progression of fibrosis. Myoﬁbroblasts are regarded as the major matrix and collagen-producing cells in the liver but also in other tissues. Neo-expression of the alpha isoform of smooth muscle actin (α-SMA) is used as marker for activated myoﬁbroblasts. Most studies have focused on fibroblasts, which form focal adhesions (FA) during mechanic stress that link the cell’s actin cytoskeleton and plasma membrane to the underlying ECM[37,66]. It should be noted that biomechanics has been intensively studied and discussed previously with regard to liver fibrosis[14,37]. Mechanic forces or stress can act in various manners and directions on tissues and cells either by compression, elongation/stretch or shear forces (Figure 9A). Cell surface integrins, which connect to cytoplasmic actins at the site of FA, bind to latency-associated peptides (LAP). On soft surfaces there is minimal resistance to cell generated tension and the complex remains latent. On stiff surfaces there is significant resistance to cell-generated tension, this tension increases, and the LAP is pulled open, releasing active TGF-β. However, it has been less appreciated so far that intra-vascular pressure such as SP could be the typical physiological signal of cellular/tissue stiffness. Pressure is not directly visible in histological sections and can only be seen when looking for indirect morphological signs e.g., dilatation of the liver sinus (Figure 6). At the cellular level, SP translates into specific mechanic forces that mainly include stretch forces/stress in contrast to shear forces (Figure 9A). This is due to the enormous broad vascular bed of the liver with a rather slow sinusoidal blood flow (static and dynamic stretch forces, Figure 2). Like other cells, fibroblasts and HSCs are known to contract and to respond to mechanic forces. The SPH puts SP as major mechanistic upstream event of fibrogenesis (cause of fibrosis). Increased SP will result in well-defined stretch forces of perisinusoidal cells e.g., of HSCs and ultimately cause stretch-induced collagen deposition (Figure 9B). SPH may also explain the so-called pericellular fibrosis as is commonly observed in patients suffering from ALD but also other liver diseases. Pericellular fibrosis describes collagen deposition around single ballooned hepatocytes (Figure 9C). 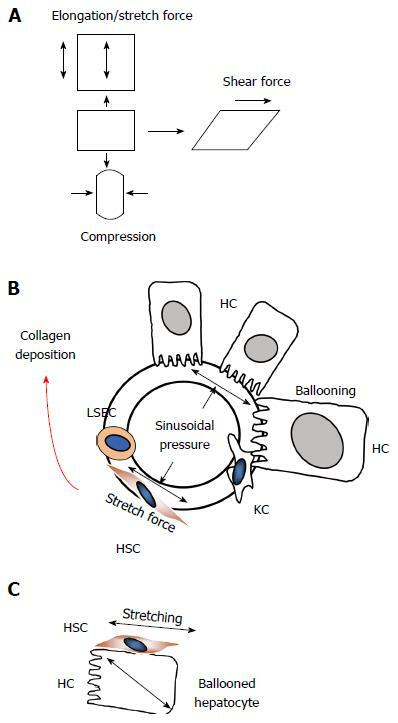 Here, intracellular pressure causes stretch forces from inside the hepatocyte that will be also detected by aligned stellate cells and finally lead to mechano-mediated collagen deposition. Thus, both intravascular and intracellular pressure can cause stretch forces at the hepatocyte membrane with consequent stretching of HSC and/or elevation of cellular stiffness. (1) Pressure whether static (oncotic, hydrostatic) or dynamic generally determines tissue stiffness. It is well known that e.g., arteriovenous shunt implantation in renal failure patients undergoing dialysis rapidly causes an induration and thickening of the vessel wall. In this operation, a vein is used for the shunt formation and the induration is popularly known as “arterialization”of the shunt. In addition, it can be commonly seen in patients with prolonged non-inflammatory edema of the lower extremities e.g., during chronic heart failure that skin induration remains despite the elimination of the edema or the underlying cause. These long known and general observations point towards an evolutionary-conserved principle of “pressure-mediated wall thickening of vessels”. It seems that the connective tissue at morphological boundaries of e.g., the blood compartment follows a “program” in order to resist and withstand pressure. According to these considerations, the liver would be especially vulnerable to small pressure challenges since the liver is generally exposed to the low incoming pressure of the portal vein of less than 6 mmHg. In fact and in contrast to other organs, the liver is anatomically completely embedded into the venous drainage system of the splanchnic organs. It can be easily imagined that wall-thickening occurs at small SP elevation and that loss of fenestrae and capillarization will result in a loss of liver function. It will also drastically impair the enormous hepatic exchange of metabolites. (2) We have increasingly learnt that elevated LS per se seems to be a risk factor for cirrhosis progression (e.g., LS elevation in response to alcohol or upon HCV infection). It appears that patients who progress to fibrosis show early elevation of LS and LS elevation precedes fibrosis progression[3,26,27]. In contrast, only ca. 30% of patients with ALD and elevated transaminases show LS elevation while the remaining 70% have normal LS despite inflammation. Moreover, successful HCV treatment lowers or even normalizes LS. Likewise, autoimmune hepatitis causes significant LS elevation that can be rapidly normalized if treated timely. More examples could be given with regard to other liver diseases. In contrast, no fibrosis progression has been observed in patients that did not show an LS elevation in response to a viral disease or toxin. If LS is regarded as measure/correlate of SP (in non-cirrhotic livers, Figure 4B), it consequently means that a lack of SP elevation prevents fibrosis progression. (3) It clearly appears that a normal LS excludes chronic liver disease and liver pathology. So far, no exceptions have been observed from this “rule of thumb”. On the other side, there is an enormous variation of LS in response to fibrogenic stimuli with some patients progressing faster to “stiff livers” than others. More details about the relation of LS and liver function will be discussed below. 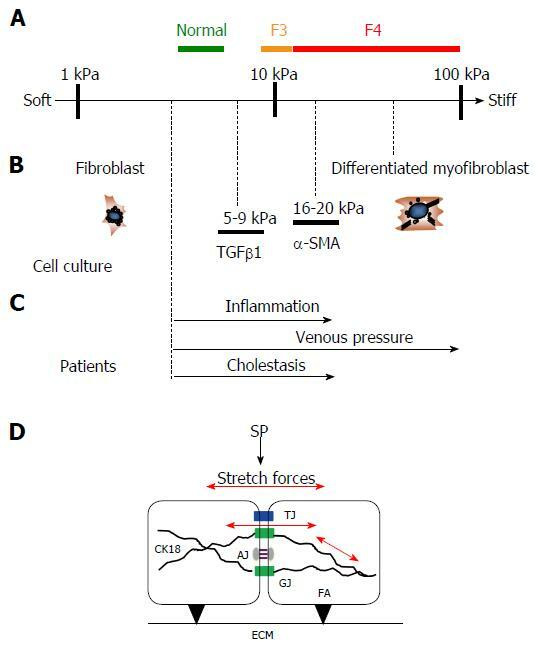 (4) It is quite striking to see that comparable stiffness values have been observed in patients with various liver diseases and confounders and in cellular studies analyzing the pro-fibrogenic response of HSC and fibroblasts under culturing conditions with exactly defined stiffness as assessed by atomic force microscopy (for details see Figure 10A-C). The identical levels of stiffness and profibrogenic conditions both in clinical and cellular studies are a strong argument for the role of pressure and pressure-mediated stiffness elevation in fibrosis progression. (5) In contrast, short term LS elevation during acute congestion or acute alcohol exposure (Figure 3) does not cause fibrosis pointing towards the time of pressure exposure as critical parameter. In confirmation, acute forms of hepatitis with short flairs of transaminase elevation (e.g., acute hepatitis A or acute autoimmune hepatitis) do not develop liver cirrhosis and typically show a limited time of LS elevation of 3-5 wk. Therefore, the time of LS elevation of 4 wk seems to be critical for the development and reversal of fibrosis. (6) In about 7% of patients with liver cirrhosis, a so-called hepatofugal portal flow is observed. In these patients, portal flow has completely reversed. Concordantly, the wedged hepatic venous pressure is higher than the portal pressure which clearly points towards a primarily arterial cause of hepatic perfusion in such patients. SPH helps to explain why fibrous septa of bridging cirrhosis may span through the whole organ over large distances. In this concept, SP increases stretch forces that will superimpose over larger distances without the presence of additional e.g., humoral “pro-fibrogenic factors” since mechanic forces will simply add up according to the laws of mechanical physics. These resulting stretch forces are not only confronted with the liver capsule but all elastic and connective tissue within the liver. As a result, fibrous tissue will span over several layers of liver tissue in the centimeter range. The concept of SPH opens up novel targeted studies that address in more detail the role of fluid mechanics in the liver which has unique features as compared to other organs. First, as already mentioned above, the liver is an organ exposed to a low-pressure environment (4-6 mmHg) which can be optionally put under high pressure by the hepatic artery. Second, capillary, adhesion, shear and other forces are insufficiently understood in the liver and they all could contribute to SP. Moreover, the stretching forces do not only put endothelial cells on stage but also all other liver cells with intra- and intercellular filaments and junctions (Figure 10D). In summary, SPH increases the awareness of mechanic forces in the pressure-sensitive liver. It also links to specific forces at the cellular level (stretch vs shear forces) and could explain the uniform responses of various cells to pressure (e.g., HSC vs fibroblasts) avoiding the necessity to search for specific “profibrogenic” cells. SPH could also explain the uniform response of fibrosis formation to very different and heterogeneous liver pathologies and their combinations. All liver pathologies are related to changes of the SP whether they are of vascular, inflammatory, non-inflammatory or other origin. Within this concept, SP is a complex result of inflow and outflow activities. Supplemental Figure 3 shows schematically the consequences of a periportal (HCV) or pericentral (ALD) inflammation, initially causing periportal or pericentral fibrosis and ultimately bridging fibrosis. Naturally enough, pressure-mediated fibrogenesis will be modulated individually by many genetic and environmental factors at various levels. SPH strongly draws attention to the modulation of intra- and extrahepatic pressure modulation by intrahepatic shunts and extrahepatic collaterals. Shunts per definition bypass blood and thus will efficiently lower pressure gradients. Although microscopic intrahepatic portosystemic shunts have been recognized for many years they are difficult to study. In contrast to arteriovenous shunts, they are present in almost every patient with established cirrhosis and they shunt about 36% of the portal flow. On the other side, arterio-portal hepatic fistulas have been occasionally described[63,64]. As a logical consequence of SPH, especially intrahepatic shunts should efficiently lower SP and thus halt pressure-mediated fibrosis progression (Figure 8). Shunt formation, however, would bypass hepatocytes and, hence, decrease liver function. Thus, the liver could only escape fibrosis progression for the cost of decreased liver function. It would be highly attractive to test whether such mechanisms are indeed an essential part of the liver’s physiology to escape high pressures. It could also explain recently observed different types of patients with liver cirrhosis, those with high stiffness but excellent liver function (type M1) and those with rather low LS but very limited liver function (type M2)[21,22,67]. A broad spectrum of all kinds of variations can be observed daily and the biology behind is not well understood nor has it been implemented for risk stratification or transplantation. These considerations could eventually lead to a novel typology of liver cirrhosis. SPH with pressure as major driving force could help to better design, delineate and interpret the so-far overwhelming and confusing data obtained by high through-put screening technologies including the many and still rapidly improving genetic or OMICS approaches. It is quite conceivable that pressure is a very complex, highly controlled and evolutionary conserved vital parameter in all mammals. It also could help to better integrate still poorly understood findings e.g., on the role of genetic risk factors such as certain polymorphisms of the PNPLA3 gene (adiponutrin) for fibrosis progression. It seems quite clear that pressure-mediated processes that ultimately cause fibrosis will be strongly modulated by genes. It is also easily conceivable that SP with all confounders discussed herein are co-modulated by genes e.g., transporters that effect water and electrolyte metabolism, the vessel boundaries, pressure-controlling hormones but, of course, also the response of the biomechanical signal transduction cascade in response to elevated pressure. The high kinetic energy of the heart-beat is preserved in the elastic aorta and then propagated to peripheral tissues via the pulse wave. Due to the stiffer peripheral arterioles, arterial pressure ultimately increases in the periphery being highest in the arteries of the lower extremities. Almost nothing is known about the consequences of pulse-wave energy propagation in the liver. 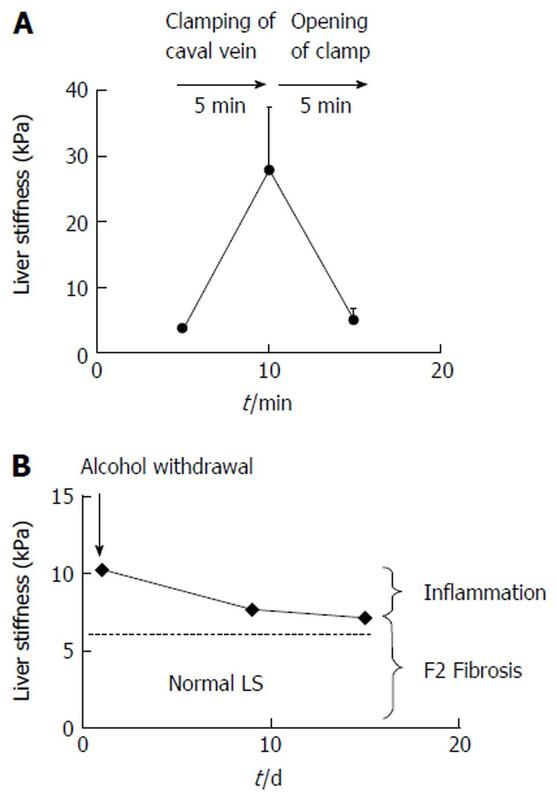 It is easily conceivable that stiffening of the liver during fibrosis progression but also by pressure-related confounders (Figure 3) could cause a much stronger, Tsunami-like release of mechanic energy in the liver. Moreover and as discussed below, liver fat could be an unexpected and very efficient “sound energy absorbing” factor such as commonly observed in abdominal ultrasound. It will be of high interest to study in more detail the mechanic role of pulse wave energy and hepatic steatosis for SP elevation and fibrosis progression. The role of steatosis is increasingly and controversially discussed. However, a major physical property of fat is the absorption of mechanic forces or sound energy. Here, SPH could provide an alternative to partly interpret the role of fat on a mechanic basis. Whether the sum of export, elimination, import and synthesis of hepatic fat has mechanic consequences remains to be elucidated. Preliminary data in patients with ALD suggest that steatosis is not correlated with LS which fulfills the general perception that fat tissue is soft. It has also been occasionally observed that LS decreases while steatosis drastically increases (as measured by non-invasive CAP) during improvement of acute hepatitis of various etiology. On the other side, multiple studies on NAFLD patients found a correlation of elevated LS and steatosis but it remains to be clarified whether this is due to co-existing inflammation in these patients. Moreover, SPH would provide a better explanation why e.g., segmental steatosis not necessarily translates into segmental cirrhosis. SPH also draws more attention to the shock wave absorption of the pulsatile heart beat that will drastically increase e.g., at the interface of an artery to the cirrhotic liver. A fatty liver should better attenuate these forces and thus help to at least halt the deleterious effects of mechanic energy exerted by the pulse wave. Taken together, a mechanic approach towards hepatic steatosis could provide a completely novel view on liver pathology. Liver diseases with a more pronounced SP elevation throughout the whole organ are more likely and more rapidly to progress to cirrhosis (see also the simplified vascular architecture of the liver in Figure 8). Thus, certain Zone III localized hepatic diseases such as Budd Chiari syndrome and Schistosomiasis are known to rapidly produce cirrhosis and they are known to strongly increase LS[68-70]. SPH may offer novel possibilities to explain such clinical observations. It is also known that e.g., ALD primarily starts in the region of the central vein causing so-called perivenular fibrosis. In a recent large multicenter study on 2068 patients with biopsy-proven HCV and ALD we could show that inflammation in the lobular zone (ALD) translated into higher LS elevation as compared to a portal-tract-pronounced inflammation such as HCV infection (see also Supplemental Figure 2). According to SPH, a pericentral liver disease will cause a more efficient SP elevation with consequent fibrosis progression. Supplemental Figure 3 provides a simplified scheme of the sequential events of fibrosis formation in ALD and HCV according to SPH. Thus, the localization of the inflammation determines the initial elevation of SP. Infiltration of inflammatory cells and the increase of vascular resistance due to cellular swelling and edema will cause the typical inflammatory hyper-perfusion which can be detected by elevated LS. A prolonged too intensive and too long inflammation will ultimately cause predominant hepatic arterial perfusion with permanent SP elevation. Taken together, SPH could provide a novel concept to better comprehend fibrosis progression based on the localization of the inflammatory disease. WHAT ARE POTENTIAL LIMITATIONS OF THE SPH? If the SP is important for fibrosis progression why then has it not been addressed so far? There are several plausible reasons: First, SP cannot be measured directly without affecting the pressure itself for technical reasons. Second, pressure changes are typically accompanied by changes of other important parameters such as blood flow or oxygen supply and it is an experimental challenge to dissect these confounders. Third, SP is not easily identified by popular molecular screening techniques (gene sequencing, RNA microarrays, proteomics, metabolomics) that are favored at present to identify novel target molecules. Fourth, histology does not provide direct and immediate information on pressure except some indirect features shown in Figure 6. In fact, pressure can only be studied in vivo within intact organisms with integral boundaries and functioning blood circulation requiring cumbersome detection technologies. Although there are good arguments in favor of SPH it remains unclear to what extent SP contributes to fibrosis and whether known (e.g., TGFβ) or additional mediators of fibrosis significantly modulate pressure-induced fibrosis. Future studies and innovative research tools will hopefully be able to further dissect pressure changes from changes of other important conditions such as hypoxia. It can be also assumed that many pressure-relevant aspects of the liver are genetically inherited in a complex manner. SPH hopefully will help to better design and interpret the findings from genetic screening studies. HOW TO DISSECT SP FROM HYPOXIA-MEDIATED LIVER PATHOLOGIES? A specific challenge for SPH is the dissection of pressure-related effects from hypoxia-mediated consequences. The individual hepatocyte is predominantly exposed to ca. 2% oxygen while intravascular oxygen levels vary dependent on localization (venous vs portal) and range between 8% to 16%[72,73]. It is well established that the portal zone 1 is exposed to ca. 16% oxygen while the precentral zone 3 see significantly less oxygen of ca. 8%. Already the pioneering article of Sherlock on cardiac cirrhosis pointed out the difficulties to dissect pressure-associated changes from hypoxia-related aspects. In fact, since pressure changes are always and immediately accompanied by flow and oxygen changes, it may be almost impossible to rule out directly the distinctive role of both important parameters. In addition, as mentioned in the chapter above, it is still not possible to directly assess SP and oxygen levels in the liver sinus without disturbance of these factors for technical reasons. However, in my opinion, some general considerations and indirect conclusions are in favor of the SPH concept. First, hepatocytes and other liver cells tolerate quite low oxygen levels. In fact, real hepatic ischemia is rarely observed. It typically leads to drastic elevation of transaminases up to several thousands of units e.g., during cardiac arrest. Thus, as long as no such drastic transaminase elevations are observed, the involvement of hypoxia seems to be less likely. Second, although the portal tract is much more efficiently exposed to highly oxygenated blood from the hepatic artery, portal-tract localized liver diseases such as chronic HCV also develop fibrosis as compared to zone III disease such as ALD. Finally, namely the development of large fibrous septa at the whole organ level are difficult to comprehend based on oxygen levels but rather point to trajectory forces caused by pressure elevation. Nevertheless, it will remain an open and highly interesting area of research to further dissect the role of SP and hypoxia and even more likely the role of hypoxia in modulating pressure-induced fibrosis. As mentioned above, pressure itself is a physiological key process of mammals which is controlled by many cellular, nerval and hormonal conditions that all link to matrix formation. In fact, the epithelial boundaries are critical for pressure maintenance and they put all aligning cells of the vascular system whether they are veins, arteries, capillaries or specialized vascular entities such as the hepatic sinusoidal bed on stage. For instance, while FA and ECM-cell mechano-signaling have been intensively studied[14,37], intercellular mechanotransduction (intercellular junctions of parenchymal cells and intermediate filaments) and its relation to pressure is largely unknown and would require adequate animal models for validation. Therefore, future studies should address these molecular mechanisms. A list of such potential studies is provided in Table 2. One potential strategy is the use of well-established in vitro models under pressure-mimicking conditions with varying stiffness using viscoelastic gels (e.g., polyacrylamide)[74,75]. The stiffness of these gels should be comparable to human fibrosis stages and validated using the Fibroscan or atomic force microscopy. The various liver-associated cells could be studied independently, individually or in combination using co-culture approaches. Important cells should not be restricted to HSC and fibroblasts, but also endothelial cells, hepatocytes and macrophages. The role of intercellular junctions and important molecules responsible for mechano-signaling could be examined in 2D vs 3D cell cultures. As mechanistic proof of principle, hepatic mechano-conditioning using stretch chambers and fat loading (in the absence of lipotoxicity) to lower cellular stiffness could be studied. Such studies could then be translated to in vivo animal models. For instance, the time of onset of LS as compared to fibrosis development, invasive pressure measurements in different compartments (portal, central venous, systolic and diastolic arterial pressure), mechano-signaling and the expression of intercellular junction molecules could be studied in well-established inflammatory and non-inflammatory fibrosis model (TAA vs congestion). The animal models would allow to study the onset of arterialization in cirrhotic livers using vascular immunostaining and the role of intercellular mechano-signaling. The new insights could help to identify novel treatment strategies e.g., to lower LS or, second, to better identify patient sub-cohorts that are at increased risk to develop fibrosis via mechano-signaling due to SP. Another important issue will be the interplay of SP with hypoxia and angiogenesis and how this affects vascularization of the sinusoidal bed including shunt formation. Table 2 Potential studies to elucidate sinusoidal pressure-mediated mechanisms of fibrosis. 1. Matrix-modulating effects of pressure-lowering or modulating drugs. 2. Physical aspects of pressure formation in biological tissues including the role of cardiac pulse wave energy and its mechanic absorption by fat. 3. Effect of water metabolism, water channels (aquaporins), electrolyte transporters and other transporters and osmotic pressure on matrix formation. 4. Role of pressure-mediated biomechanic signaling for matrix formation including genetics, proteomics and metabolomics. 5. Role of ECM, cellular and inter-cellular junctions on pressure-mediated matrix formation. 6. Role of SP on gap junctions and matrix formation. 7. Role of vasoactive systems/substances, such as nitric oxide, cyclooxygenase-derivatives, carbon monoxide and endogenous cannabinoids on SP and fibrosis. 8. Role of vasoconstrictor systems, such as the sympathetic nervous system, vasopressin, angiotensin and endothelin-1 on SP and fibrosis[80,81]. 9. Optimization of pressure sensors e.g., for the liver sinus including the development of molecular stretch force measuring sensors. 10. Association of pressure, tissue/cellular stiffness and matrix formation at various organizational levels (cell, organ and whole organism). 11. Interplay of organ systems involved in water and pressure regulation (e.g., heart, brain, kidney and liver) for pressure regulation and matrix development. 12. Role of liver size and globularization of liver in various species in order to better sustain stretch forces of SP elevation. 13. Mechanisms and modulation of vessel and shunt formation in the liver. ECM: Extracellular matrix; SP: Sinusoidal pressure; SPH: Sinusoidal pressure hypothesis. SPH could boost and stimulate basic and clinical research activities not only restricted to liver disease but also the bidirectional role of liver-diseases within the whole organism and its relation to other organs such as the heart, kidney, or lung. Some potential therapeutic consequences are listed in Table 3. It may further lead to a re-evaluation or optimization of established supportive standard therapies in cirrhotics. Thus, SPH could help to explain the predominantly and widely discussed beneficial effects of pressure-lowering drugs such as NSBB and it could help to optimize treatment regimens, patient selection and a better understanding of their mechanisms[76,77]. Second, SPH sheds new light on the long-term therapy with diuretics in cirrhotics. Diuretics may not only remove excess water from the body according to a symptomatic approach but it may intercept with the viscous cycle of continued water retention, SP elevation (hydrostatic component; Figure 2) and fibrosis progression. It will also be quite exciting to learn whether the liver has a more immanent role in other diseases with water retention such as cardiac insufficiency. On the diagnostic level, non-invasive LS measurement may help to monitor and optimize treatment of liver diseases especially with its direct link to SP. At the molecular level, the therapeutic desirable lowering of SP directly leads to a better understanding of hepatic mechano-signaling and the regulation of SP at the cellular level. Potential novel molecular targets or strategies could be identified that may include mechanic conditioning or pharmacotherapy acting on mechanosignaling. The mechanic role of fat has been already discussed above and, based on preliminary observation, warrants further analysis. Further studies on SP will also require the implementation of liquid physics to better understand the dynamic component of SP and its role on fibrosis progression. Finally, the role of osmotic stress, the regulation of the hydration status of the cell and the role of water channels such as aquaporins will be likewise highly interesting to study in the context of SP elevation and fibrosis progression. Table 3 Direct clinical consequences of sinusoidal pressure hypothesis. This hypothesis paper is dedicated to Helmut K. Seitz in memory of our longstanding friendship, the many discussions and his continued support of my work. I would further like to thank (in alphabetical order) Pierre Bedossa, Eckart Hofmann, Carolin Lackner, Ana Elena López Echevarria; Gunda Millonig, Johannes Mueller, Felix Piecha, Vanessa Rausch, Martin Rössle, Daniel Rost, Laurent Sandrin and Helmut K. Seitz for many intensive discussions and/or for critical reading of the manuscript. I finally like to acknowledge the Dietmar Hopp foundation and the Manfred Lautenschläger foundation for their financial support over the last years.